Sunny Side School Stunt Pogo Demo! WOW! Where to start. Don't worry. Everything falls together. Well one day I was at a garage sale..wait I can't tell you that till I tell you this. Seven in morning I was really bored. I was up all night, so I decided to go pogo. After a few minutes I started to wake people from there sleep and they complained. I needed to oil my pogo because it was really loud, squaky, and ignoring. I didn't have any oil. I was mad because I wanted to pogo. Then I decided to pogo at the park. I left to the park. Their was a dad there with two of his kids. They were on the swings playing looking at me. I started showing off on my pogo. Doing Peg Stall all over the benches. Then he walked up to me and told me how cool it was. I let him try the pogo and his son. They loved it. Later he told me that he was a famous basket ball player and coached the women’s team in an collage. He was going to Sunny Side school later that day to do motivated speaking. Later I had to go to get to school. Ok now for the garage sale part. Sorry about that. My Pogo Stick broke and I was desperate to get a new one. I went to many garage sales looking and looking. I was out for hours. I was about to stop when I came to one of the last garage sells. I went up to a lady who looked like she was in charge of it and asked her this,"Hi, would you happened to have any pogo sticks here?" She replyed."HaHaHa! Pogo Sticks. They are fun. Nope. I'm real sorry. But want to her a funny story I heard of one lately?" "Well I'm a teacher. 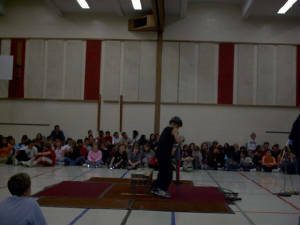 At an assembly, there was a basket ball player how was talking about seeing a guy who was really awesome on a pogo stick. He talked about how he jumped the whole time doing no hands and other stuff." I chuckled to myself and said,” I think that might have been me"
She reply in Shock,” Really???" "Yes HaHaHa. He said that." "Yes. All the kids at Sunny Side would love to see you. They think you were a fictional Character. I could ask the principle if you could do a show for us"
I replyed,"I would love to do that. But wouldn't it have to be during school hours...I would have to ask my parents first." Ok Kids...Never do this. This is Bad what I did. She went to get a paper. "ok, sorry. What are they"
"My name is Alex Dunbar and my Number is 5**7**5**7"
Than I left with the biggest smile on my face. So... that day I went home and told my parents they thought it was really cool. But they weren’t sure if I should go. I told them that I gave her my number and stuff and she was going to call you. They weren’t impressed that I gave her are number. Two days later she phoned my mom and told her what has happening. She told the Principle and he said yes. I had to come later that week to do a little show for them and interview. Just for the teachers. My mom told me and I got really excited. I started practicing like crazy with Nathan. I bought another Stick for the show. It was lucky that I did because the other one broke. I woke up. It was the day of the event. I went to my garage to find my pogo stick...but It wasn't there!!! I felt sick wounding what I would do. I started looking everywhere and I still couldn't find it. There were ten more minuets till I had to leave. I started thinking. I ran up my front door steps to tell my dad. And there it was... on my porch. I quickly went on and practiced to get warmed up. My Father came out and said it was time to go. So I lifted up my pogo stick bench and put it in the van. I jumped in the car and drove off. He drove up to Sunny Side School. I quickly went out of the van. I went to the back of the Van and my dad helped me get my Pogo and Bench out. When we were done I reported to the office. The Vice Prinble was there. He said he will bring some people to help me carry in the bench. He walked me to the gym to show me where I was going to perform. It was a giant gym. Right in the center there were five carpets duct taped to the ground so I would not slip. The people came in with my bench and pogo. They placed it on the carpet. I gave the Vice Principle my paper with the tricks I was going to do because he was going to pronouse them when I was going to perform them. He said he had to go a little more paper work and he will see me when I start. I started pogoing and getting even more warmed up. Classes started to walk in so I stopped cause I didn’t want to give anything away. I had a giant smile on my face and couldn’t stop. I was so happy. Than the Vice Princble walked up and announced me. He told me to do some easy tricks. I did them with a few fun combos. I started doing harder tricks. Than I stopped and I had to tell the whole school (550 People) how I started. I Started,” Hi, my older brother got a pogo stick for his birthday. He wasn't interested in it at all but my sister liked it. It was a black pogoroo. She tried it out and was pretty good on it; when I tried I couldn't even get one bounce. She persevered with just jumping and got very good at it. Than the Vice Principle called a few people up to try. They couldn’t stay on for only a couple of jumps. They left. Than the Vice Principle asked me to do some more harder tricks. I started. The whole gym was looking at me amazed. Clapping. I started landing all these tricks that I never tried before. I was shocked and picked it up and shacked there hands. I went and grabbed my bench and pogo stick and walked out of the gym.